We couldn't agree more. Come visit our local library. A quiet place to study, relax, work or simply escape in a good book. It's fun, the old-fashioned way. 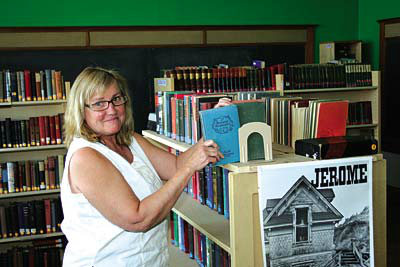 Head Librarian Kathleen Jarvis, with the help of a loyal, volunteer crew and some grant funding, developed the Jerome library into a vibrant, organized facility. The library features an old book collection that Ms. Jarvis saved from obscurity. Now visitors can access the historical books as well as Sanborn Maps created between 1867 and 1970 for assessing fire insurance liability. Additionally, our library has an extensive children's library and interactive area. Computers are available for the public to use.